Time for Sesame Street! And a Sesame Street toddler bed is one fun way to transition your toddler from his ‘baby bed’ (the crib) to a ‘big boy’ or ‘big girl’ bed: a toddler bed that allows easy in and out, but is still low enough to the ground that a tumble won’t hurt. If you’ve decided to go with a Sesame Street toddler bed you have two good options. Both are sturdy steel frames with strong plastic headboards and rails; and both are in fun, primary colors. Both have two siderails to keep your child safe, and both are low enough to the ground that your child will have no trouble getting into bed. Which you decide may depend on whether your child’s love of Sesame Street is liable to be a passing phase or if you can count on it continuing through to the end of the toddler years. The Delta Enterprise Sesame Street 3D Toddler Bed is the ideal bed for a dyed in the wool Sesame Street lover. Not only is there a fun Sesame Street decal on the headboard, the footboard from this bed features an enormous 3D Elmo with a big orange nose. The bed is meant for a child of up to 50 lbs; but is sturdy enough that an adult can climb on for a nightly story time. Although it comes disassembled, assembly is not too difficult if you have a screwdriver and know how to use it. The downside of the 3D Sesame Street Toddler Bed? There’s no disguising it as anything else, so if, six months down the road, your toddler decides he no longer likes Elmo, he will either have to learn to deal with sleeping in a bed he doesn’t care for or you will have to make your twin bed transition early. 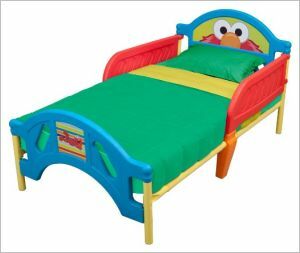 That’s why some parents may prefer the ‘Sesame Street Plastic Toddler Bed; in spite of the name, this bed has exactly the same proportion of plastic as the other, and is essentially the same bed, but with a different footboard. 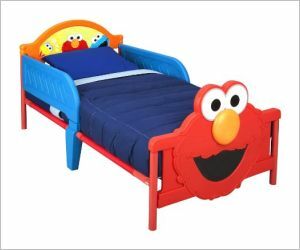 Rather than a three dimensional Elmo head at the foot, this bed has simply a minimalistic blue headboard with a relatively small Elmo decal. Once you’ve bought your toddler his Sesame Street toddler bed, you may want to shop for Sesame Street bedding that can coordinate and make his bed extra fun. 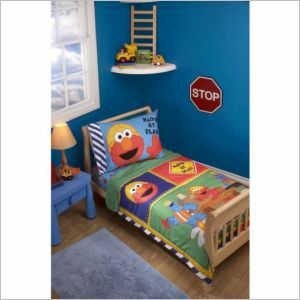 The Sesame Street Construction Zone 4 Piece Toddler Set is a nice polyester/cotton blend bedding set: a comforter, top sheet, fitted sheet, and pillowcase. The design is multicolored and cute; and the material used is durable and relatively soft. If the sheets seem stiff when they first come out of the package, throw them in the washer, and you’ll find the stiffness disappear with the wash water. Another option is the ABC 123 4 Piece Toddler Bedding Set; another set that will coordinate beautifully with your child’s new bed. The colors here are slightly brighter, and rather than a polyester/cotton bed, this set is 100% polyester. The comforter is on the thin side, so ideal for summer weather; in winter, consider layering. 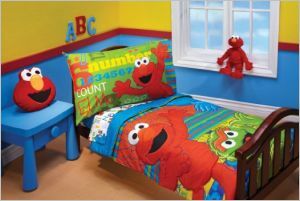 Is your little one still nervous about making the change from his or her crib to the big Sesame Street toddler bed? Take it slowly, and talk up the change with every opportunity. Let your child get excited about the bed, and maybe even let him or her help set it up. Then read a book on ‘big beds’ together: a fun Elmo book on the topic is Sesame Street’s Big Enough for a Bed, a board book even a two year old will enjoy and understand. Don’t make it a requirement, make moving to a big bed a fun part of growing up, and something to be proud and excited about!